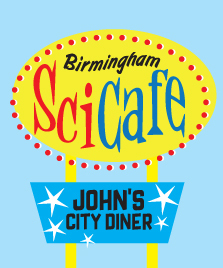 Join other science geeks (and science novices) for an exciting presentation, lively discussion and a little science trivia at the Birmingham SCI Cafe, every third Tuesday at John’s City Diner in downtown Birmingham (112 Richard Arrington Jr Blvd N). All SCI Cafes are free to the public and no science background is required. The fun begins at 6 pm with science trivia, then continues with the guest speaker at 6:30 pm. The Birmingham SCI Café is a joint project presented by McWane Science Center and the Civitan International Research Center at UAB. By combining our efforts, we are giving scientifically curious people the opportunity to interact with scientists, researchers and enthusiast from diverse fields. Together, we are bringing this unique learning experience to the Birmingham community! Alabama Genomic Health Initiative: Dr. Ashley Cannon, MS, PhD, tells about how UAB is at the forefront of a program aimed at preventing and treating disease, including certain types of cancer, heart problems, and genetic disorders.